Young Maulgar had a toothache; several in fact. Daddy Gruul phoned the dentist. "My young ogre has some teething problems. Can you come and take a look?" And so, off went Doctor Vargoth, qualified dentist and arch-mage, with his 25 dental assistants. "Oh my!" said Vargoth, "You have 4 rotten teeth! They'll have to come out!" The secret was in the pulling of the teeth. Vargoth's 25 dental assistants quickly got to work, expertly pulling the teeth and disposing of them. Poor Maulgar was a spoilt little ogre though, and he wasn't used to pain. After his teeth had been removed, he started to throw a tantrum. We... may have given him a little too much ketagnome, because he didn't get back up. Now we have to explain things to his daddy. But that's okay... we're good at explaining things. after wasting many brain cells i finally figured it out... .. u c.. its funny coz maulgar is saying aaa... to vargoth.... much ...like ....when u r at the dentist!!!! what will cart come up with next! 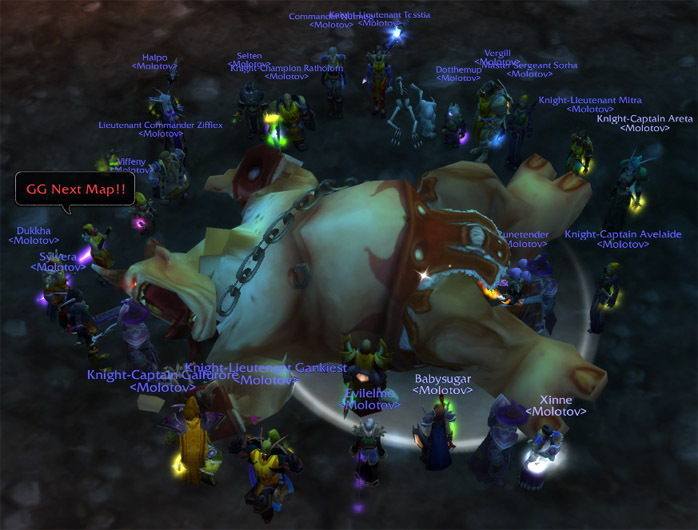 Big gratz on progression yall.. why is gruul not dead yet? PS: What is rune doing under maulgars diaper? Cart: Rune... is there anything worn under Maulgar's kilt? Rune: Nope. All in perfect working order.